The poll – sponsored by Google and conducted by the publisher of CFO Magazine – is based on over 300 digital responses from senior finance management working at large US-based companies. 76 percent said a “solid Cloud computing strategy” will be important for their company’s success within the next twelve to eighteen months. 52 percent say their companies are in the process of considering or implementing a Cloud-based system. 40 percent of respondents said their companies consistently include Cloud-based options alongside on-premise options when evaluating new systems. 12 percent say they already prefer Cloud-based systems over traditional on-site servers. 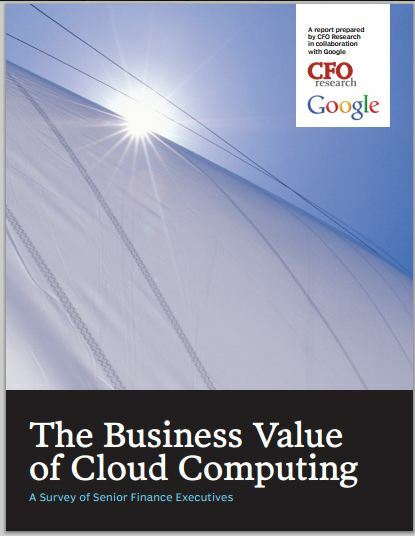 71 percent said their largest Cloud computing project resulted in lower hardware costs. 66 percent said they saved money on system backup and data recovery. 66 percent noted a reduction in software costs. 59 percent saved money on labor costs associated with IT. 64 percent said complete implementation of Cloud technology would lower operational costs by up to 20 percent. 68 percent said Cloud-based systems would “meaningfully improve” IT’s ability to focus on high-value activities, such as setting corporate strategies. 30 percent of respondents at companies with Cloud-based systems in place say the Cloud exceeded their expectations for improving employee mobility, and 35 percent say it improved productivity. 52 percent are including Cloud-based systems in their IT purchasing decisions. 68 percent of respondents cited security as an obstacle in implementing Cloud technology.